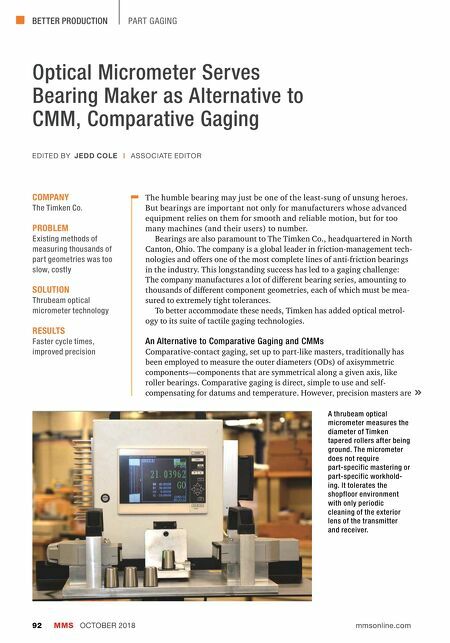 BETTER PRODUCTION MMS OCTOBER 2018 92 mmsonline.com PART GAGING Optical Micrometer Serves Bearing Maker as Alternative to CMM, Comparative Gaging The humble bearing may just be one of the least-sung of unsung heroes. But bearings are important not only for manufacturers whose advanced equipment relies on them for smooth and reliable motion, but for too many machines (and their users) to number. Bearings are also paramount to The Timken Co., headquartered in North Canton, Ohio. The company is a global leader in friction-management tech- nologies and o•ers one of the most complete lines of anti-friction bearings in the industry. This longstanding success has led to a gaging challenge: The company manufactures a lot of di•erent bearing series, amounting to thousands of di•erent component geometries, each of which must be mea- sured to extremely tight tolerances. To better accommodate these needs, Timken has added optical metrol- ogy to its suite of tactile gaging technologies. An Alternative to Comparative Gaging and CMMs Comparative-contact gaging, set up to part-like masters, traditionally has been employed to measure the outer diameters (ODs) of axisymmetric components—components that are symmetrical along a given axis, like roller bearings. Comparative gaging is direct, simple to use and self- compensating for datums and temperature. However, precision masters are COMPANY The Timken Co. PROBLEM Existing methods of measuring thousands of part geometries was too slow, costly SOLUTION Thrubeam optical micrometer technology RESULTS Faster cycle times, improved precision EDITED BY JEDD COLE | ASSOCIATE EDITOR A thrubeam optical micrometer measures the diameter of Timken tapered rollers after being ground. 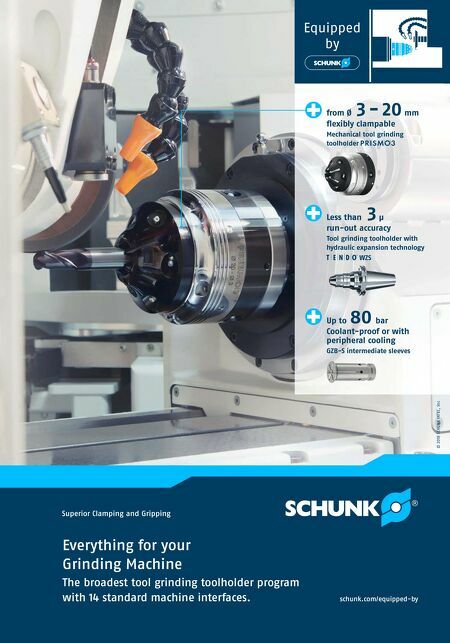 The micrometer does not require part-specific mastering or part-specific workhold- ing. It tolerates the shopfloor environment with only periodic cleaning of the exterior lens of the transmitter and receiver.